Supernatural events are happening that Paul Stepola can’t explain. But when one event hits close to home, Paul can no longer deny the truth. 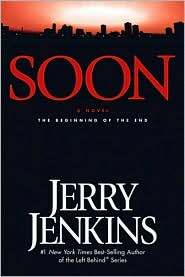 Book 1 of the Underground Zealot series, by Jerry B. Jenkins. In the aftermath of World War III, the world is resolved as never before to eliminate war. The war killed millions of people and wiped out entire countries. Now, all nations have agreed to remove the most serious threat to world peaces. The solution? Outlaw religion. Paul Stepola plays a key role in the world’s backlash against religious extremists. As an agent working for the National Peace Organization, Paul relishes his job. It’s not enough for Paul that law has forced religion underground. With unlimited resources, he is determined to expose religious zealots — flush them out and destroy them. His quest points him to startling revelations. Supernatural events are happening that he can’t explain. The religious underground calls them miracles. Paul calls them conspiracies. But when one event hits close to home, Paul can no longer deny the truth. When will the world discover the astonishing climax to these events? When will the nations learn they are experiencing a new beginning … the beginning of the end? Book 1 of the Underground Zealot series.